By now we know that Anthropogenic Global Warming (AGW) theory has been built on a mixture of hype and massaged data. Various carbon tax schemes have been put forward, even unprecedented proposals for a world wide taxation authority to be overseen by the UN. Does it follow that the primary agenda behind the fraud was implementing these new taxes, or were these proposed tax schemes secondary and part of a proclivity on the part of the state to seize any opportunity to enhance revenue? In the three decades since AGW was made into a political tool by Margaret Thatcher’s Conservative Party, tax laws have been “reformed” many times in Britain, as well as other Western nations dominated by the AGW meme. Margaret Thatcher and her Conservative Party were known for their opposition to social leveling through taxation. Reduction of public services, combined with hectoring the disadvantaged about self reliance, were hallmarks of British politics through the 1980’s and beyond. In Europe and North America, today’s overall level of taxation is not higher than that prevalent in 1979. In Britain and the US, governments have been able to utilize the issuance of sovereign debt to increase military budgets while at the same time reducing capital gains and corporate tax rates creating an era of “borrow and spend” growth for the state sector. In the US, the higher income tax brackets have come down while middle class employees have seen increased social security deductions from their paychecks. These revenues were then “borrowed” by the general fund and in fact replaced the revenues lost due to the reduction of corporate taxes. The burden of financing government spending has been increasingly shifted to the median wage earner and away from the investor and high income earner. Adoption of a tax collection system based on the consumption of energy would seem to fit into this general pattern, since working people spend a larger portion of their earnings on energy, and goods derived from energy, than do the wealthy. However, this outcome could be easily achieved by implementing a flat tax on income or a national sales tax. The rationale used to promote the flat tax is much simpler and would have been more likely to succeed than pushing the AGW carbon tax through fraudulent scaremongering. Right now a national sales tax would be politically far easier to implement in the US than a carbon tax. Since the 1970’s we have seen capital controls lifted allowing for the free movement of capital through most of the world. New tax credits and deductions came into existence which were, in fact, incentives for multinational corporations to shift their operations from industrialized nations to the third world. Lower corporate tax rates could be found in the third world while profits were repatriated at favorable rates. This enabled the shifting of production, and later services, to the third world through tax policies. The Kyoto protocol looked suspiciously similar to these tax policies in that it also created an advantage for the deployment of capital in low wage nations. A “free trade” regime without tariff barriers would allow for the hyper-exploitation of third world labor while at the same time driving down first world labor costs. But due to the combined competitive disadvantages of poor infrastructure, inexperienced workforces, and transport costs, as well as the necessity of writing off stranded production assets in the developed nations, corporations based in the advanced economies demanded that their governments finance the restructuring of the global economy. Lower labor costs just couldn’t compensate for the disadvantages of moving to China or India, at least not until infrastructure was improved and workforces were trained. Without government assistance, offshoring corporations would fail to compete in the marketplace with established industry at home. This motive, providing advantages to investment in the developing nations, is more plausible than the commonly assumed notion that the motive behind the AGW fraud was an excuse to raise taxes on consumers. There is a weakness in this proposition that is similar to the weakness described above regarding carbon taxes though, governments could have aided their corporations through tax advantages without all the complexity and risk involved in the AGW fraud. Yet, there is another motive that is much more certain than either of the above possibilities, even more certain than the profits that Goldman Sachs stood to gain from carbon credits trading schemes. To understand this motive we must return to the time when the AGW meme was first promoted. Three Mile Island had recently been shut down following a near melt down. Unknown quantities of radioactive material were released across a vast area of Pennsylvania. 2,400 lawsuits were filed for death or disease suffered by family members which were ultimately denied access to federal courts. In the US, applications for construction of new nuclear power plants had a zero chance of approval by local authorities. The nuclear industry had come to a standstill. At the same time national policy makers, in conjunction with the military industrial complex, wanted to maintain a dynamic nuclear industry that included ongoing mining, milling, enrichment, research and development as well as a large pool of personnel with nuclear expertise. In fact, Thatcher’s situation was particularly strained in that she wanted to discharge tens of thousands of coal miners, replacing them with the politically poisonous nuclear power plants. This feat would require an overriding fear, something that calls for the public to acquiesce and reserve their strong objections. There would be no way to sell such policies to the public without resorting to a paradigm changing ruse, one that defines any dissidence as a danger to the safety of society. AGW would provide that cover. In fact, it is hard to imagine any other paradigm change that could have subverted the environmentalist opposition to the nuclear industry. If the AGW theory could be planted within a co-opted or deceived environmental movement, general acceptance of the alarmism would be seen by many as a victory for the environment despite the fact that CO2 is not actually a pollutant. An entire field of “science” could be elevated with the sole purpose of confirming the AGW theory, creating a consensus of credulousness among its membership whose entire careers are always at stake. The din of propaganda would remain constant until a state of emergency appeared imminent. Nuclear power plants would be presented as the way out while the absence of any solution for nuclear waste disposal would be ignored. The high financial cost of the nuclear facilities would be absorbed much later by rate payers while the government would underwrite the investor’s risks. A 1957 study by the Brookhaven National Laboratory estimated “the consequences of a very large reactor accident at a hypothetically small nuclear plant near a large city” at 43,000 injuries, 3,400 deaths and $7 billion in 1957 losses. Congress passed the “Gore Bill” of 1956, championed by then U.S. 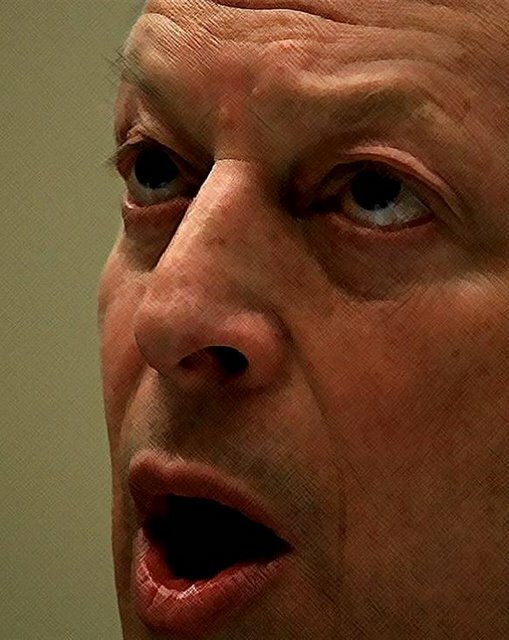 Senator Albert Gore (Sr.) of the pro-nuclear Gore dynasty. This became the Price Andersen Act — reauthorized by Congress again in 2002 – shielding the industry from significant liability for any major nuclear accident. The 1989 Presidential Commission of Inquiry into Catastrophic Nuclear Power Accidents determined that private nuclear corporations would be unlikely to survive unless the federal government insured the industry against such “unexpected and unknown” potential liabilities as the Bhopal disaster (Union Carbide), Agent Orange (Dow) and the Dalkon Shield. The U.S. Government is blazing a trail of nuclear weapon revival leading to global nuclear dominance. A nuke-revival group, supported by people like Stephen Younger, Associate Director for Nuclear Weapons at Los Alamos, proposes a “mini-nuke” capable of burrowing into underground weapon supplies and unleashing a small, but contained nuclear explosion. This weapons advocacy group is comprised of nuclear scientists, Department of Energy (DoE) officials, right wing analysts, former government officials, and a congressionally appointed over-sight panel. The group wants to ensure that the U.S. continues to develop nuclear capacity into the next half century. The US nuclear energy industry is overseen by the Department of Energy, which also oversees the nuclear weapons complex through the National Nuclear Security Administration. The reliable lifespan of the current nuclear arsenal is measured in decades. Due to the untested decay characteristics of plutonium it is possible that much of the present arsenal could become unserviceable with little advance warning. The existence of a robust nuclear industry is a prerequisite for new weapons production capability which may be the main factor in Energy Secretary Chu’s strident support for a new generation of nuclear power plants. AGW has been instrumental in the resurrection of nuclear power in the US and Britain. Seen in this light, the AGW fraud is not surprising. The mass collusion in lies is actually a normal occurrence when “national security” is perceived to be involved. Institutions and foundations are relied upon to perform their roles. Entire industries conform to the dominant anticipated cap and trade system. Other nations have been co-opted or pressed into accepting the AGW meme. One only has to consider the warmongering lies about “Iraqi WMDs” or “Iranian nuclear weapons programs” to put the AGW fraud into perspective. Spaking of Three Mile Island- did you know shortly after the “event” the film “China Syndrome” was released? What a timely article – I’ve been thinking about this all day. taxpayers will subsidize the building of the plant which will then charge the same people for the power while also they pay for disposal and indemnification costs. What industrialist wouldn’t salivate at such a plan – the modern-day “company store”. Nuclear also keeps power-generation centralized… the better to maintain control of the many in as few hands as possible. If our controllers were actually interested in reducing CO2, one would expect to see a movement toward organic locally-grown farming. Instead Canada is currently negotiating the “Canada-EU Comprehensive Economic and Trade Agreement” (CETA): A Plan for Privatization of Public Services which promises to outsource/offshore more local goods & services. Actually Margaret Thatcher was only interested in breaking the back of the coal mining unions in Britain. She wanted to massively downsize coal production but she didn’t trust the arabs with the oil alternative. Her solution was the nuclear industry. To justify this she held a meeting with climatologists at let it be known that there was “money on the table” in the form of large research grants for those who could prove the theory that man-made Co2 largely from coal burning power stations was a climatic threat. Naturally trough feeders such as the university of East Anglia took up the challenge (For money). Honest climatologists were ostracised and fired. The pork feeders than fabricated the case in exchange for over 13 million pounds of taxpayer money funnelled largely into their pockets. The fact that the East Anglian “Jones gang” of climate scam merchants are not facing long jail sentences for grand fraud and racketeering is because this can’t be done without exposing huge criminal complicity in the government itself.